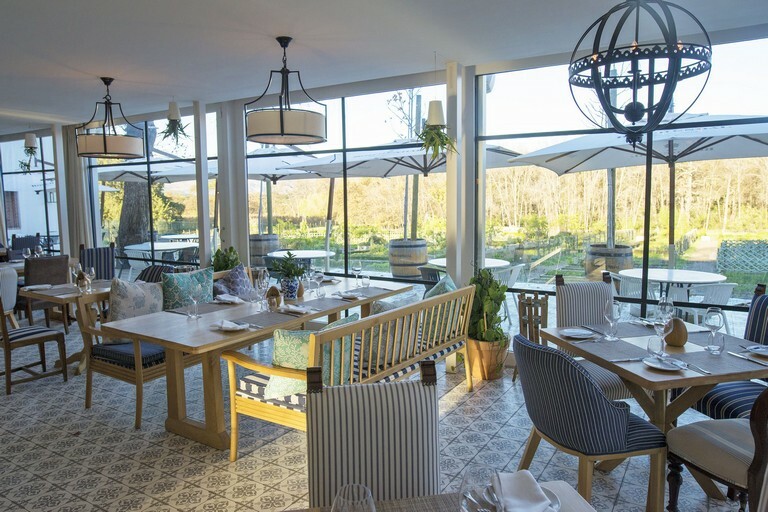 There are a great many pleasures to be experienced at Boschendal, and high on the list is a meal at The Werf Restaurant, helmed by chef Christiaan Campbell. At its heart is the nine-hectare vegetable garden on the restaurant’s doorstep, which has a significant influence on the menu daily, as well as through the seasons. “The food has to be driven by the garden,” Campbell told me between courses. “Growing your own food is a serious responsibility, and we aim to use all the parts of the plants.” And it’s not just the kitchen staff who harvest and forage daily; waiters are also sent out to pick herbs or flowers or whatever else Campbell decides is needed on the plate. Speaking of which, Campbell has made a concerted effort to move away from overly complicated and fussy plating and to illustrate the simplicity of the dishes with fewer components in focused portions. In addition to the garden, Boschendal has a large herd of Black Angus cattle (served in the restaurant, and sold at the butchery as steaks and biltong), chickens, sheep, and some pigs which are the beginning of a pasture-reared pork project. Farming is ethical and sustainable, and Campbell embraces the nose-to-tail philosophy – something he’s been doing for years, long before it became fashionable. This is why, right at the beginning of the meal, you are served sourdough bread with tallow margarine. Don’t panic – this is margarine the way our grandparents knew it, before it became all horrible and synthetic. Tallow is the rendered fat of beef, and occurs in various guises on the menu…like what they call “potato crispies” which are fried in it. This particular side dish needs special attention; without a doubt, they are the most delicious, best ever, incredible, wonderful (okay, you get the idea) roast potatoes you could hope to encounter. I generally follow a low carb lifestyle (not slavishly, thank goodness), but I ate the entire bowlful and have zero regrets. Sitting on the veranda overlooking a small part of the magical veggie garden – around which you are invited to stroll, I was served by Eric Ndlovu. His intimate knowledge of the menu and his recommendations guided my choices, and he took a personal delight in my happiness and enjoyment of said dishes. After a carrot and passion fruit jelly delicately decorated with pineapple sage and teeny tiny carrot flowers as an amuse bouche, I had pulled lamb belly and Parisian gnocchi served with umami-packed lamb broth, poured at the table. This was followed by salt-baked brisket with potato “sauce” and beef neck marmalade. This is a sticky, meaty accompaniment with some secret ingredients – like chocolate – which turn it into something you just want to eat with a spoon. With the roast potatoes. Twice. A hot smoker outside the front of the restaurant is a fairly new feature, so look out for dishes coming out of there. At Campbell’s urging I had not one, but two desserts. It was a hot day so I was irresistibly drawn to the flaky puff pastry and strawberry semi-fredo, which Campbell admitted is one of his favourites. It was simply perfect for the mood and the weather. With no intention of having more than a bite, I had the roasted white chocolate ice cream sandwich as well. I finished it all. Still no regrets. There was also a little sample of the mead currently being developed in the kitchen, along with all manner of other interesting experimentation and tasting and testing. I recommend you set aside a good few hours to make the most of a lunch at The Werf. Afterwards I visited the tasting room in the manor house to buy a bottle of the estate’s flagship Bordeaux blend, which I’d had with the brisket, and which is only available at the farm. Then I wandered down to the butchery to get some nice wet, fatty biltong. Along this oak-lined avenue is also the deli and the bakery. And then, just because it was too lovely not to, I lay in a hammock and swayed gently in the dappled sunshine for a bit. * Boschendal is on Pniel Road in Groot Drakenstein, outside Franschhoek. The Werf Restaurant is open for lunch Wednesdays to Sundays, from 12pm until 2.30pm (guests to be seated by 2pm); and for dinner Wednesdays to Saturdays from 6pm till to 9pm (guests to be seated by 8.30pm). To book at The Werf, call 021 870 4206; or send an email to werf@boschendal.co.za. For more information, visit www.boschendal.com. Mother City Fine Dining by Bianca Coleman. Read more restaurant reviews here.